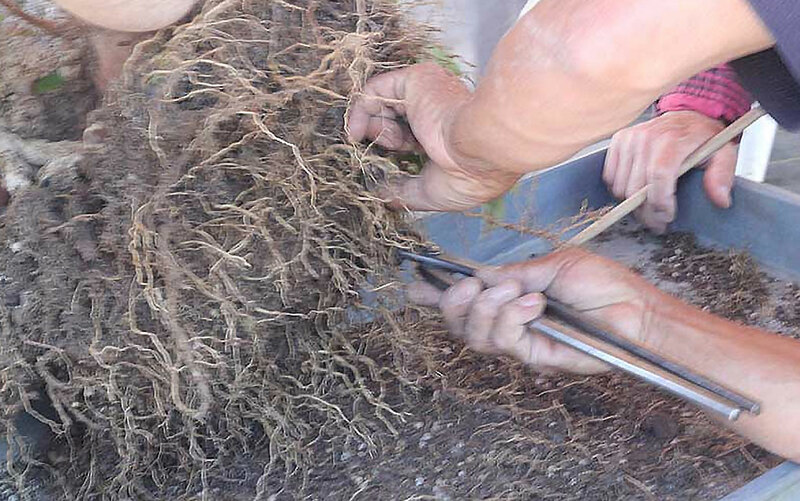 Working with your bonsai tree’s roots is sometimes a neglected task. Most enthusiasts will concentrate on the foliage and trunk. However, well maintained roots always lead to healthy foliage. Below are some of the essential tools we use when working with our bonsai tree’s roots. Repotting Stick: During repotting season, the repotting stick is THE most often used tool. When you remove the tree from a growers pot or an old pot, you’ll find that a good amount of soil is stuck to the roots. The soil and the roots love to create a tangled mess. The stick is great for maneuvering into the center of the clump and loosening the soil. Rather than just stabbing at the soil, use a pulling motion to bring the soil out of the roots. Older Shear: We recommend using an old shear for root cutting. The shear still needs to be sharp but a designated shear will enable you to keep your primary foliage pruning shear extra sharp and shiny. You don’t want to accidently try to cut a rock and dull your good shear. Root Cutter: When cutting thick roots, you’ll want something strong. Root cutters are made for this purpose. The design of the root cutter will help you create a solid straight cut directly on the part of the root you wish to cut. You can also use it to put the root inside the root cutter and pull on the root to help loosen it. Previous articleTrimming Roots: Will it kill my tree?